From googling “gratitude journal,” the practice apparently began in 1996 when Sarah Ban Breathnach created The Simple Abundance Journal of Gratitude as a companion to her popular book Simple Abundance: A Daybook of Comfort and Joy. “Gratitude is the most passionate transformative force in the cosmos,” promises author Sarah Ban Breathnach (Simple Abundance) in her introduction. I believe it, Sister Sarah! Sarah asked journalers (journalists?) to write five things every day that they felt grateful for and said they would feel their lives shift within a couple of months. In 1998, Oprah Winfrey had Sarah as a guest on her show, and as we all know, Oprah just knows goodness. The gratitude journal took off. I was raising an adolescent girl going through her most difficult period, in an often-strained relationship. Actually, looking back, keeping gratitude journals would probably have been a fantastically wonderful practice for us to share back then, if she had deigned to share anything with me. Hmmm. She’s changed, and so have I. Today I feel grateful for my whole experience of motherhood. From pregnancy (easy), through childbirth (difficult), to the moment I held my new baby in my arms for the first time and she wrapped her tiny fingers around my little finger (instant love), I have been blessed to have had a child, a daughter, and specifically my daughter, Lela Rose, who is 29 years old now. 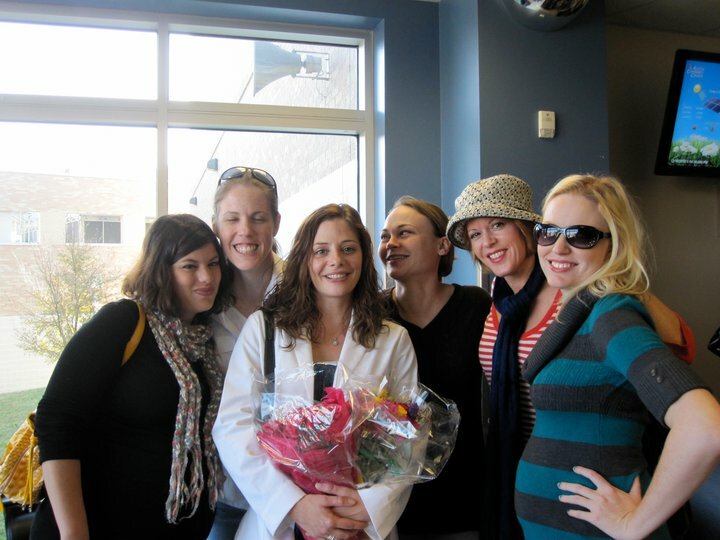 Lela at her Dec 2010 graduation from nursing school, with her women friends. I watched and helped her grow up, even as I grew up more myself, and she has turned out to be a mensch, a true human being. I see her in her young adult years now, a mother herself, starting her nursing career just this week, moving through struggle to accomplishment. I see her self-esteem, her worthiness, her competency, her intelligence, her endearing goofiness, her wisdom, her discipline, her caring, her limits too. What I am most grateful for about being a mother is the personal growth that raising her brought to my life — the growing up that I had to do, the inner work of exploring my values, learning when to be flexible and when to stand firm, the changes that being her mother brought to my life. Today I feel grateful for my women friends, in particular Clarita and Linaka, whom I spent time with last night. We go way back to 1995 when we began ecstatically dancing together. That is 16 years of knowing each other, talking, coming together and moving away, seeing each other through difficulties and joys and sharing them, traveling together, cooking and eating together, always laughing together, and lately doing NLP with each other. I feel blessed to have so many women friends, new and old, near and far. There is something about the friendship of women that is so nurturing. I think we let our hair down when it’s just us, in a way that we don’t or can’t with men, because we share the lifelong experience of being women in this culture. And when we have common interests and affection for each other, the connecting is abundant. Today I feel grateful for those people I’ve encountered so far in my life who are skilled intuitive healers. I’ve mentioned Patrice, my acupuncturist, and Chandler Collins, my chiropractor, on this blog before. Yesterday I had a heart-centering bodymind session with Bo Boatwright, who is a chiropractor but who has learned and developed a method that one could do with just a massage license. Having experienced one session with Bo, I’d say his work with me on the table was a combination of massage, chiropractic, myofascial release, rebirthing, and visualization. He rolled me and moved me to find the stuck places, and he dug into the stuck places, having me breathe all the while, until my body spontaneously began to release stress/tension/stuckness in the manner of rebirthing and trauma releasing exercises. A couple of hours later, in a moment of quiet stillness, I noticed a new space in my heart center, an openness that wasn’t there before. Thanks, Bo. I’m grateful for you. And heads up, you are teaching me. This entry was posted in books, breakthrough, breathing, compassion, connecting, gratitude, love, NLP, story and tagged bodywork, gratitude, healers, rebirthing, trauma releasing exercises, women friends by MaryAnn Reynolds. Bookmark the permalink.